Brad Ziegler and Ryan Tatusko are definitely right up there with Neshek. Both players frequently break boxes of cards at a time, as well as interact with fans online and sign really well TTM. I’m sure I’ve said it a number of times in a number of different places, perhaps even here… but I love me some Neshek. 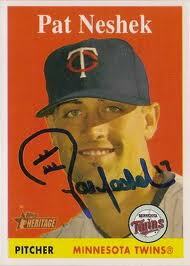 I had the pleasure of meeting him at TwinsFest a couple of years ago and he couldn’t have been friendlier. One of the favorite parts about where I live is the fact that I live just two blocks from where Pat went to high school.